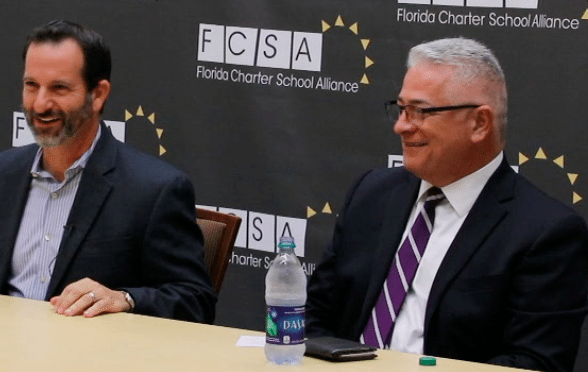 November 3, 2017 – Daytona Beach, FL – A hosted a Legislative Update & Advocacy Workshop with State Representative Michael Bileca, Chair of the House Education Committee, on November 1st — opening day of the Florida Charter School Conference. The charter school principals, governing board members, and stakeholders who participated in the meeting got a chance to talk to Chair Bileca about their concerns and wish list for the upcoming legislative session, and his thoughts on the challenge to HB7069. You can read about that meeting here or watch a video recap. We also participated in the conference’s Opening Session. Ralph Arza addressed attendees and presented Rep. Bileca with the FCSA 2017 Charter School Quarterback award in appreciation for his leadership and support of the school choice movement in Florida . FCSA Executive Director, Lynn Norman-Teck, presented at two breakout sessions during conference. The first, presented with Jenna Hodgens from the Hillsborough County Public Schools, dealt with District/Charter School Relationship. Click here to read about that presentation. The second session, Branding Excellence, gave participants tips for marketing their schools to potential students and teachers. Click here to download that power point. 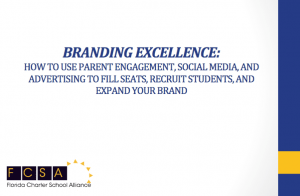 For more information about FCSA events at the Florida Charter School Conference and our 2018 Legislative Priorities, contact us.